Mousse may be served as a complete dessert or may also be assembled over sponge cakes to create elegant yummy and soft textured cakes for special occasions. Here’s an easy way to make a lovely looking and colorful mango raspberry mousse cake which is multi layered, multi colored and multi flavored. Note: Gelatin contains non-vegetarian substances so use agar-agar if you are strictly vegetarian. Cut the sponge cake horizontally with a long blade knife into two halves and keep aside for a while. Line a 9 or 10 inch Springform pan with plastic sheet. Let the sheet hang outside of walls of pan, place one cake layer in the center at the bottom of spring form pan, leaving space all around. Add lime juice into pureed raspberries, toss to mix and then stir in gelatin or agar-agar dissolved in 2 tablespoons hot water, mix well. Beat whipping cream with electric beater until soft peaks form, stir into pureed strawberry mixture, mix gently then pour over cake layer placed in spring form pan. Let the mixture flow all around the cake also. Refrigerate for half an hour. 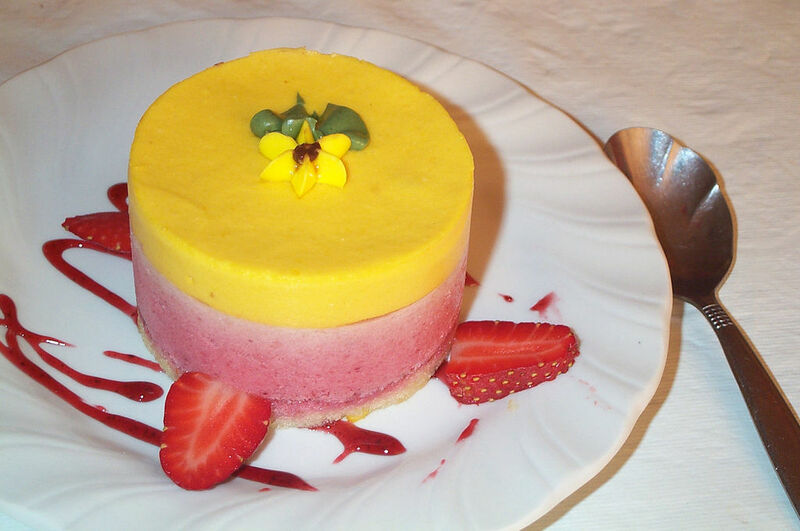 Repeat the process to make mango mousse, just use mango puree instead of raspberry puree. Bring out the cake from refrigerator and place another layer of remaining half of cake over set raspberry mousse. Pour the mango mousse over cake layer in the same manner and let it flow from sides of cake layer to cover it from all sides. Refrigerate again for at least an hour or until serving time. Bring out of refrigerator 20 minutes prior to serving time, loosen and lift the side walls of spring form pan and gently release the plastic sheet from all around the set mousse cake. Transfer onto serving platter carefully with the help of a wide flat spatula. Garnish with berry slices and mango cubes, serve chilled and enjoy.